He drives a 2017 Armada. The new Armadas do not have the HBMC. Only some of the 4x4 new QX56/80 have the HBMC. I drive a 2012 QX56/80 and it has the HBMC. Do you have any QX80 owners in Australia with lifted Infiniti QX80? I would love to see pictures. I don't know for sure if all the lift kits on the Patrol would fit exactly on the Infiniti QX80 suspension. But my guess is it will fit. The only problem here is you guys in Australia do use your car offroad. In America here, you will not find any new body Armada or QX going offroad. Let alone lifting it. If we find one, it will be 1 in a million. It will be very rare. Or say we may even never see it any time soon. People who drive this car are concerned about scratching it. Can you please show us some pictures of some lifted Nissan Patrols that have the HBMC? Last edited by PetitFrereArmada; 12-06-2018 at 06:17 PM. He is driving a 2017 Armada. The new Armadas do not have the HBMC. Hi mate see below a pic of my Y62 Ti lifted 2'' with HBMC and 35'' Muddies. Do you have more pictures? Can you post there? I wanted to see from different angles and if you can make the picture bigger. that would be great. Do you have details of your lift? How many inch lift? 2 or 3.5? From what manufacturer? Any more details about the lift or a link to see all what you bought and used? Did you install new upper control arms to be able to compensate for more wheel travel? What brand control arms? Your HBMC still works ok? Do you have a build thread that shows everything you did with pictures/ if yes, would love to see a link. I have tons of pics but my posting rights on this site prevent me from adding my very own new post. Ontrack 4x4 make the lift kits. New UCAs are about to be released (January) much better then the total kaos ones. My HBMC work's fine with the lift. I'd encourage you to jump onto Y62 modified action Facebook page and check out both my YouTube channel "Wheeling Webber" and "Dash Off-road" for some really good content. I just responded to your PM that you sent. Let us take it there and see what I learn from you. Plus, I will go and check out these your channels for your content. Yeah, I think it is very important that that lift kit come with the UCA. I am glad you guys are making some. Total Chaos was the first to make upper control arms for the Y62. that is another US based company. So, I see you guys now want to make one that is supposedly better. Well, I see now that USA did make the first lift and UCA for that Patrol and you guys are trying to study it and make it better since you guys have real offroad experience with the products and have enough feed back to know how to improve on design and built. That is good. Too bad that though the companies are US based, they have zero sales in the US for the Armada and QX. Nobody wants to do this to their car int he US. I want to do this stuff (well, I'm in Canada--close enough), but no vendor has the cajones to bother with this platform up here. Also, if you keep saying nobody wants to off-road mod their Y62s up here, then vendors like predator bar will turn away. Stop saying that! liquid1 and Outlwd like this. Just checked out your videos, Awesome content, The Patrol is impressive. I subscribed .. Some of the comments are hilarious.. good stuff thanks for sharing..
2015 Pearl white Platinum 4x4 Gift to my wife..
2nd owner 2010 5.6L Armada 4x4 Titanium 52k miles Traded @ 74,000 miles. work hard to play hard. Check out my youtube link here. X2 for another Canuck that wants a mild lift for his truck. You know the interest is there just look at how many views this thread has. Lots of people are interested. If you are truly serious about lifting your Armada, you know there are 2 companies in the US who offer suspension upgrades for the Armada. You can contact them and get a quote for a lift. The Armada does not have HBMC. A lot of Patrol do. The Australians who drive Patrols with HBMC are ordering their suspension upgrades from one company in the US. I have contacted them and they sent me a quote and it shows to lift a QX with HBMC, the cost is $6,000 to $10,000 for parts and labor. Trust me, let us be realistic here. This is an American company with zero sales in the US/Canada for suspension upgrade. And to be honest the reason might be the high cost that no one in US/Canada may want to pay for it. But there are some very super rich people out there that money is not a problem for them. Anybody like that can contact them and buy the suspension upgrade for their Armada. If you have a Armada, it means you do not have HBMC and so your lift will be cheaper. But how much? Only you can call and get a quote and share here if you are willing to share that info. The Australians have A LOT of companies with kits for their Patrol. Let us hope that it fits the Armada or QX, but no one has done it to guarantee fitment. Some of us are guessing it will fit, but there has been no confirmation yet. This guy with the predator bar told me he is a very busy guy, so his presence on the forum is very limited. But since he has my number, we have been pretty much staying in contact. He has sent me a lot of pictures that I have shared over half of them on this thread. If you PM him and want him to be sending you info, I am sure he will do that. If what you want is a bullbar for the Armada, there is one company in the US making it already and then the other company that can custom build one for you which is in Georgia. So, if someone has not lifted his Armada or QX, and is seriously looking, there are 2 companies in the US who offer lift kits and 2 other companies who offer the bullbar with winch for the 2017 and up Armada. So you can try to contact all 4 companies to see if they offer what you may like or want. All those 4 companies have their names mentioned here and in another thread(s). Last edited by PetitFrereArmada; 01-02-2019 at 01:08 PM. 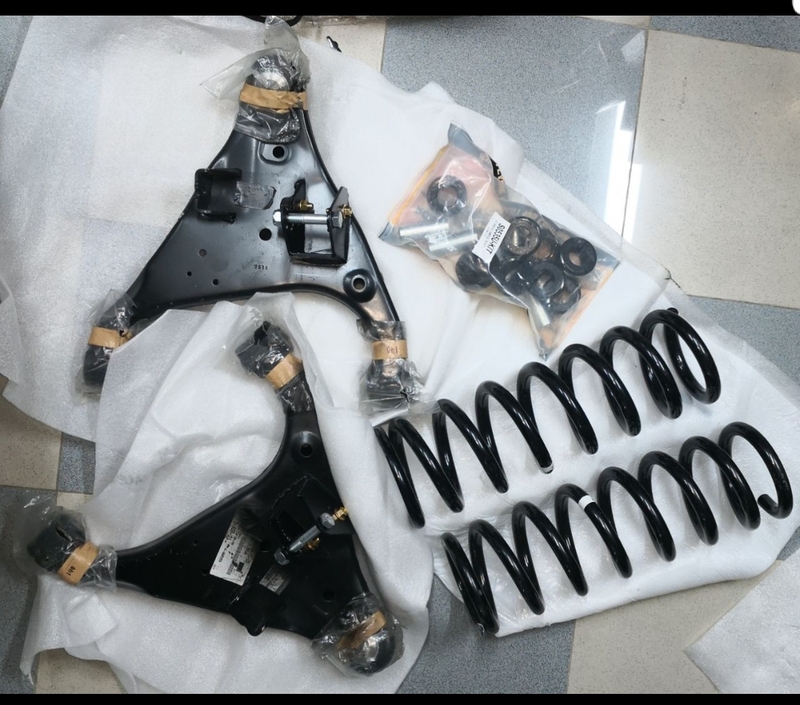 For those with QX56/80 with HBMC, the Australian 2 inch lift is done and price quote should be released soon. I hope the guy himself will come and here and mention that. This is a pic he sent me yesterday of part of the lift for the HBMC system. The pic is from the actual owner called Andrew of Ontrack4x4 in Australia. He is the one who text me this pic. Will hope to get more info from him as he is a busy guy for sure.